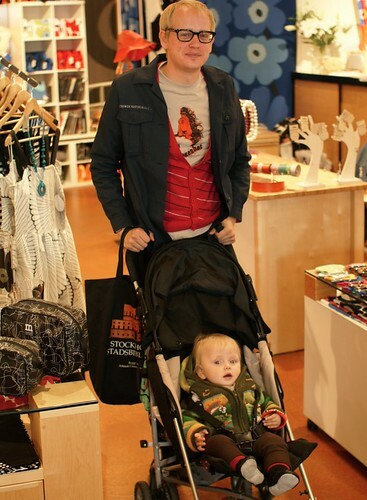 A perfect father-and-kid pair I found in Tuuli, the Finnish clothing shop in Pike Place Market. They look like they were ordered direct from Helsinki. I love his striped vest, and the kid's sweater layers are adorable. Judging from his bag im guessing he is actually from Stockholm, Sweden. This is equivalent of me getting coffee at Starbucks in Rome. Hi j - Perhaps...but at least they look much more fashionable than the average father/kid combos in Seattle. Plus he was friends w/ the owner, so I don't think he was in there shopping. Yes! Awesome. So happy to Finns! I see this duo everywhere! but usually he's with his adorable partner who has the cutest bob. She is too much! being a stylish dad is my ultimate life goal. all of this is hilarious. yes, the couple is from stockholm - they were visiting. a good friend, he is. also i would never relate him to starbucks.